I received your letter of the 26th Oct two days ago and we were all glad to hear you were keeping well and strong. You have quite mistaken me about the tea, I sent you some samples to know which kind you liked best so that I might know which kind to bring. I intend to bring some with me as I know it is purer than what you can buy in England (sic), even if cheaper, where it is adulterated so much. I get it from the Tea plantation where it is grown and prepared, they are only about 150 miles from where we live. The kind we generally use ourselves is the green bush, and if you don’t like it so strong it is very good to mix with another kind as it has a good flavour. I cannot understand why you did not get the letter I sent to George (Editor’s Note: George Paterson). When I sent it – I could not lay my hands on his letter so that I did not know his address, so I sent it to you asking you to give it to him, however I will write to him again. Jamie came home from School on Sunday last, he is taller than me. I was once thinking of bringing him home with me, but I find I cannot afford it and it would interfere with his studies and he must stick to them as close as he can now, for he is of an age now to look forward to his entering the College. You cannot teach them a trade here so that all that you can do is to give a good education to fit them for some post under Government. I will not get my Medical Certificate till the end of this month and then it has to go for the sanction and orders of Government. 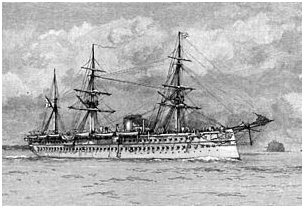 About a month ago I got a letter from the Commander in Chief’s Office stating that a passage for myself and family had been alloted (sic) to me in the Troopship that leaves Bombay on the 23rd March 1876, which is the” Crocodile” but I see by the paper you sent me that she has broke her engines at Portsmouth so that I may come in the “Jumna” who I see is to take her place; however it matters little as they are all alike. I believe the accommodation I am allowed is very good, I have nothing to do with anybody on board. I am bringing a few photos of views in India which perhaps Mr Boyd will like, and I will try and get some feathers at Eden when we get there, and if there is anything else let me know. I forgot to mention that I am only getting leave for 18 months instead of 24. We have left our house which has been rented to the College for the time I will be away. All our furniture, horses and conveyances are sold. Lettie, Jamie, Ernie and Ann send their love to you hoping this finds you still enjoying good health. This entry was posted in 1875. Bookmark the permalink.